Preheat the oven to 350 degrees Fahrenheit. Grease the interior bottom and sides of an 8x8 pyrex baking dish with cooking spray, butter, or oil and set aside. In a large bowl mix together the oats, brown sugar, walnuts, baking powder, cinnamon, flax, and salt. Stir until well combined. In a separate medium bowl, beat together the eggs, milk, vanilla, and melted butter. Pour this mixture into the bowl that contains the dry ingredients, and stir to combine. 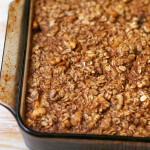 Spread the chopped apples on the bottom of the greased baking dish and pour the oatmeal mixture over the top. Use a spatula to spread the oatmeal evenly throughout the baking dish. Bake for 40-45 minutes or until the oats have firmed up but still have a moist creamy texture. Let cool slightly, then scoop your portion into a bowl and enjoy.